How many times have you driven by this statue and wondered about it? 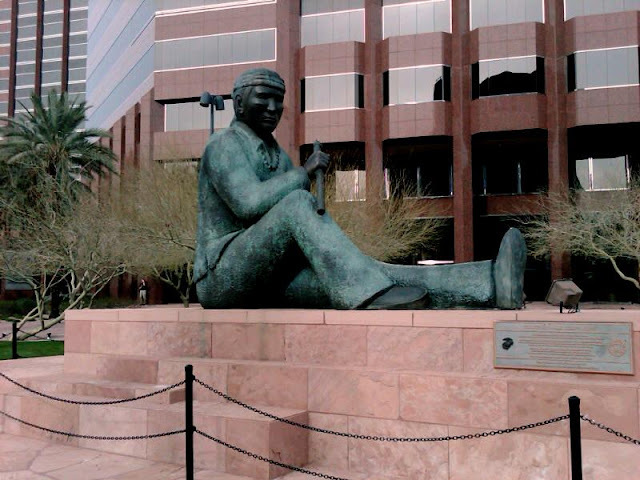 This statute by Doug Hyde is on the northeast corner of Thomas Road and Central Avenue in Phoenix and was placed in 1989 as a tribute to the Navajo Code Talkers. The statue was commissioned through the Heard Museum by Best West Properties Inc. (investor real estate owned by US WEST Inc.) and the Koll Companies, developers of the plaza project. 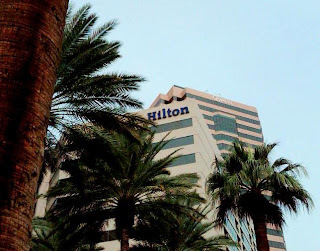 The intention was to represent communications history in Arizona and the commission was due to the location becoming the new state headquarters of US WEST Communications (now Qwest). At the time there was still some sentiment among corporations in the US to honor the heritage and influence of their industries on the communities they served. This was especially prevalent in telephone companies who had strong traditions and sense of their history and heritage. This specific example is particularly remarkable in that it recognizes the forgotten contributions of the Navajo (and other Native American) Code Talkers of WWII, the connection between historical communications of a group once considered inferior to western US civilization and modern communications. The intent was also to recognize the diversity of the employees and customers the company served. This tribute represents the spirit of the Navajo Code Talkers, a group of more than 400 U.S. Marines who bravely served their country during World War II. Their mission: to utilize the Navajo language in the creation of an unbreakable secret code. Between 1942 and 1945, the Navajo Code Talkers used this code, and their skills as radio operators, to provide a secure method of communications vital to America's Victory. Among many Native Americans, the flute is a communications tool used to signal the end of confrontation and the coming of peace. This tribute represents the advancement of peace for all future generations. This is the first permanent tribute to honor the Navajo Code Talkers.